This year is flying by! It was just St. Patrick's Day and next weekend, in a flash, it will be Easter already! 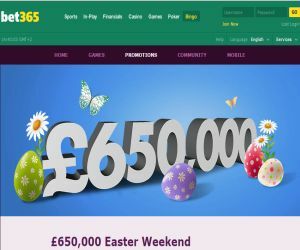 So, whether you've planned a fully-loaded chocolate eating fest or a great Easter getaway, you won't want to miss bet365 Bingo‘s sugar-rushing £650K Easter Weekend promotion! One of our fave chocolaty festivals is almost here! This means some tough decisions lie ahead of you! Cadbury's, Galaxy, Dairy Milk or some indulgent Thorntons? Stay at home for four days, check out the Easter attractions or plan a great escape to the sun? The choice is yours! While your busy deciding how to get your sugar fix and where to spend your Easter break, bet365 Bingo has lined up a fully-indulgent four day treat, bursting with cash prizes and Easter surprises! So however you're spending your Easter break, make sure you make a note in your diary to visit bet365 Bingo between March 25th and 28th March to play in a pulse-racing collection of 40, 75 and 90 ball rooms. You can literally play for pennies and bag yourself up to £5K a go! You can play in any of the featured rooms from 12pm each day, including Deal Or No Deal Bingo 90 ball, Guilty Pleasures, Rainbow Riches Bingo, A Night on the Town and The Press Room. Remember to check the site for the full schedule, but, you can play at selected times to scoop your indulgent slice of the £650,000 prized treat!